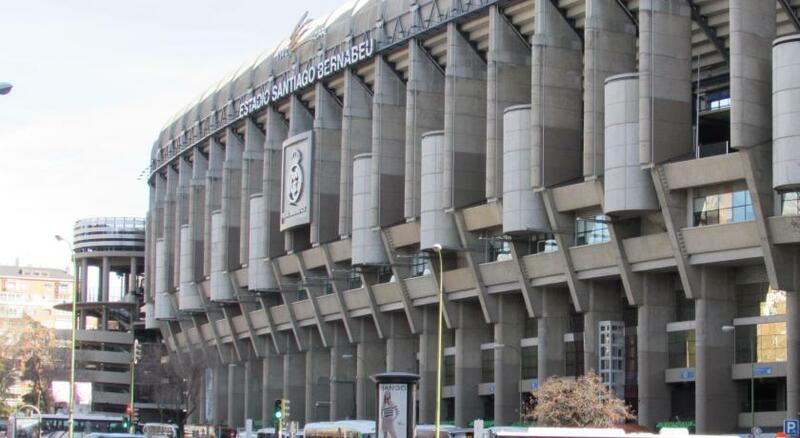 Everything was fine and the best thing is that is 5 minutes from Estadio Santiago Bernabeu !!!!!!! It was clean, quite and comfortable. Great location. Very clean, very nice, quite. Room at the 9th floor, impressive insight on the business centre. Booked this property because of the location - had a conference in the same hotel. The room was clean, wifi signal good and complimentary water well appreciated. Staff was accommodating and nice. Parking, even though a bit difficult to find, was spacious and for a decent price with the hotel discount. Generally an ok stay. Excellent breakfast. Excellent service at the cafeteria and the lobby staff. Lobby was nice, rooms where small and dirty. We disliked so much we moved to another hotel. We appreciate booking.com for working with us to get moved. The location is nice, near Santiago Bernabeu Stadium. Holiday Inn Madrid Bernabeu This rating is a reflection of how the property compares to the industry standard when it comes to price, facilities and services available. It's based on a self-evaluation by the property. Use this rating to help choose your stay! One of our top picks in Madrid.The Holiday Inn Madrid Bernabeu has a privileged location in the city's financial and business center, surrounded by the most famous stores and restaurants. The air-conditioned rooms at the Holiday Inn Madrid Bernabeu feature a flat-screen TV and a private bathroom with a hairdryer and free toiletries. Located in front of the Real Madrid Football Stadium - the Santiago Bernabeu stadium and very close to the historical center, with its monuments, old tascas and picturesque spots. Perfect for business and leisure stay, the Holiday Inn Madrid Bernabeu includes 9 meeting rooms available for a surcharge. Located only 20 minutes away by car from the airport, with direct access from the metro station Nuevos Ministerios. When would you like to stay at Holiday Inn Madrid Bernabeu? This room includes a private bathroom with a hairdryer and free toiletries. A flat-screen TV is available. This room includes 2 double beds. The private bathroom comes with a hairdryer and free toiletries. A flat-screen TV is available. This suite includes a private bathroom with a hairdryer and free toiletries.There is also a seating area and a flat-screen TV. Hotel surroundings – This neighborhood is a great choice for travelers interested in monuments, culture and sightseeing – Check location Great location - show map Guests loved walking around the neighborhood! House Rules Holiday Inn Madrid Bernabeu takes special requests – add in the next step! Holiday Inn Madrid Bernabeu accepts these cards and reserves the right to temporarily hold an amount prior to arrival. 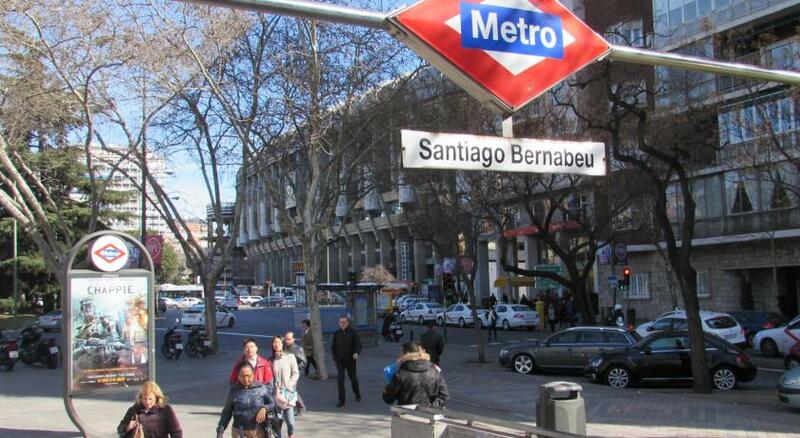 Location ideal for bernabeu, and nice restaurants and shops in walking distance, metro 10 minute walk away. Bar area and restaurant nice and relaxing. Even tho it is a non smoking venue, I could smell people smoking in other rooms. The sound isolation of the room is poor and I had a hard time to sleep listening to my neighbor’s TV all night long. Room interiors are very old and worn out. Carpet has holes in it. Needs a refurbishment. Hotel staff are very helpful and professional. Almost everything . Just because my meeting was there I chose to stay there . Cars , taxi can’t go right near the enterance . Staff were not helpful and lazy . You can fall right in front of them and they don’t care . I don’t recommend this place to anyone looking for comfort . WiFi is almost non existence . I was supposed to stay on another day but just can’t tolerate this place any longer . That information.abou parking was not clear, the hotel is old, there were hear in the bed and the room was very cold. As it is close to night club apl Saturday night there was.noise. Location very good for various visit purposes and the staff is great. Starbucks and various restoranas are in 100 m radius. The building decor is old, lift are too small and slow. Hotel is in a desperate need of renovation. 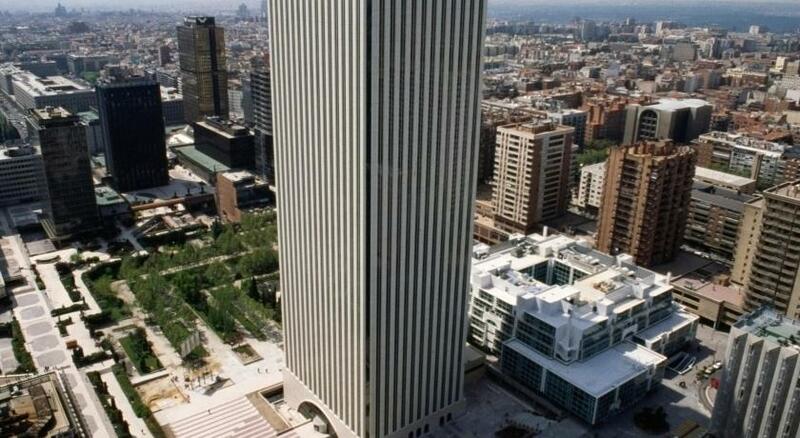 Good location in “modern” Madrid. Five min from the stadium, easy access to eating and transportation. The furniture ia kinda old. Perhaps an upgrade to newer furniture will be good. The staff were really friendly especially Sofia from the front desk reception. She helped a lot during my check in.